Anti-poverty advocates marched from city hall to the legislative building calling on the municipal and provincial governments to take action on what they say is the major issue affecting communities. 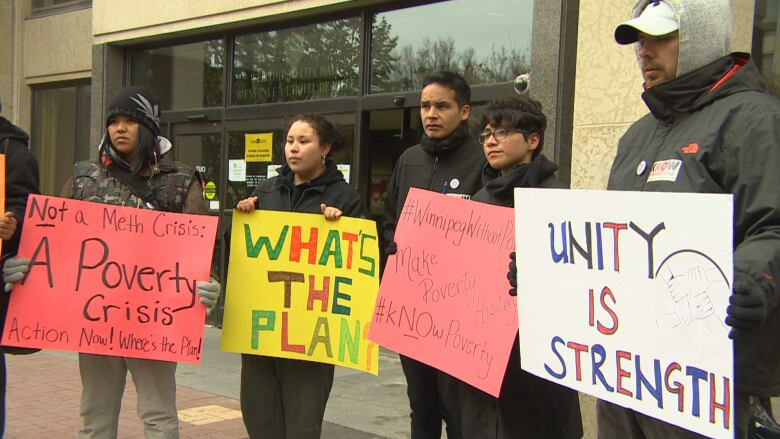 Anti-poverty advocates marched from Winnipeg's city hall to the Manitoba Legislature Thursday, calling on the municipal and provincial governments to take action on what they say is the major issue affecting communities. "We're seeing a lot in the media about meth crises, about increased crime, but we know as a community that that's stemming from a poverty crisis, that's the real systematic issue at work here," said Michael Barkman, chairperson for Make Poverty History Manitoba. The group wants both levels of government to adopt poverty reduction plans with targets and timelines. They also want to see candidates for mayor and city council make poverty reduction part of their campaign platforms. They'd like the province to replace Employment and Income Assistance with a basic needs benefit, which would form the beginning of a basic income for Manitoba. "Our data over the last several years has certainly seen an increase in homelessness, in those who are working poor, so there's multiple levels of poverty," Barkman said. Jolene Wilson lived 15 years in homelessness. Now she's the community connector for the West Central Women's Resource Centre. She says people need to look at the bigger picture when it comes to poverty. "We have so many underlying symptoms. Meth, they keep calling meth a crisis. That really bothers me, because it's not the crisis. It's a symptom. As well as homelessness," she said. The group estimates as many as 107,000 Winnipeggers live in poverty, as well as an additional 39,000 Manitobans outside the city.